Biggi Vinkeloe lives in Oakland, CA and tours frequently in Europe and North America. She plays alto saxophone and flute, both as main instruments. She is one of the very few jazzwomen working internationally. She is involved in many different projects, both as a sideman and as a leader. She composes for her own groups, and occasionally for musicians from other music fields. Whenever possible, she collaborates with dancers and painters. She has recorded almost 20 albums with European and American musicians. Working bands: Trio REV, with Lisle Ellis and Donald Robinson / Duo Robinson – Vinkeloe / Duo with Magnus Rosén / Trio Chris Brown, Donald Robinson, Biggi Vinkeloe / Chaos Butterfly + Biggi Vinkeloe / The Diplomats, with Harris Eisenstadt and Steve Swell / She performs as a soloist as well. 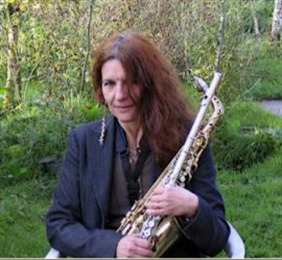 Biggi Vinkeloe has performed in Sweden, France, Germany, England, Finland, Italy, Denmark, Switzerland, Austria, Czech Republic, Canada, USA , with Peeter Uuskyla, Barre Phillips, Peter Kowald, Cecil Taylor, Ken Filiano, Steve Swell, Joel Futtermann, Alex Cline, Chris Brown, Jacques Veillé, Giancarlo Locatelli, Alberto Braida, Filippo Monico, Roberto Bellatalla, Paul Plimley, Jackson Krall, Joachim Zoepf, Georg Wolf, Gino Robair, Gianni Gebbia, Jerome Bryerton, Wayne Lopes, Paul Obermayer, Rex Casswell, Peter Friis Nielsen, Perry Robinson, Lotte Anker, Sylvie Degiez, Vinny Golia, Harris Eisenstadt, Damon Smith, Mark Weaver, Mischa Feigin, Marco Eneidi, Mary Oliver, Miya Masaoka, Donald Robinson, Lisle Ellis among others. She has performed with musicians from other boards, such as heavy metal bass player Magnus Rosén and drummer Anders Johansson; organ player Karin Nelson or New Music accordion player Marie Wärme; different choirs with music ranging from Saint Birgitta to modern music. Collaboration with dancers and choreographers, such as Inka Tiitinen (FIN), Tommy Kitty (FIN), Katie Duck (NL), Carmen Olsson (S) / with visual artists, Jake Tilson (GB), Andrew Cowie (GB), Ebbe Pettersson (S), Gilda Previn (USA). • Over the Ocean, October 2000, Sweden, with visual artists, dancers, poets and musicians from Hamburg, Gothenburg, New York, London. • • Echoes, ‘events in the exhibition’, Sweden, music series with international musicians, since 2001, at the Art Space ‘Röda Sten’ in Gothenburg (www.rodasten.se). • • European Echoes / United Nations, multi/media projects with artists from different countries. Performances in Sweden, Denmark, Germany, Finland and Italy. Since 1993. • M.A.D. (music, art, dance) with financial support by ESF-Radet (European Social Funding) and Roda Sten, with performers from the US and Sweden. Grants: City of Kungalv 1995, Bohus Landstinget 1997, Region of Vastra Gotaland 2005, Adalbertska Stiftelse (Foundation) 2005, Swedish Council for Cultural Affairs 1995, 1998, 2003 and 2005. Artist in Residence at the Headlands Center for the Arts in San Francisco spring 2001. Grants for specific projects, mostly in Sweden. Mbat with Peeter Uuskyla and Barre Phillips voted best CD of the year in Finland 1997. Imagine a Place with Magnus Rosén voted best CD of the year in Bresil 2001. Best concert of the year in Manchester 2000 with Peeter Uuskyla.